Dense fog redeveloped over South Carolina overnight on 3-4 December 2014, and as noted in the Forecast Discussion below, its character was just a bit different than on the previous night. 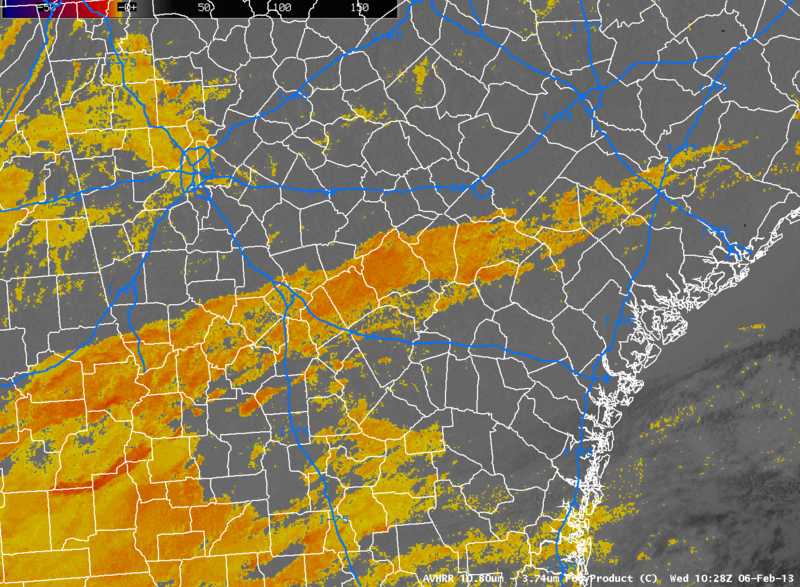 UNDER A WEAKENING WEDGE OF HIGH PRESSURE…FOG WILL PERSIST TONIGHT. WILL THEN PREVAIL INTO THE MIDDLE OF NEXT WEEK. MIX OF STRATUS BUILD-DOWN AND ADVECTIVE FOG FROM OFF THE ATLANTIC. GOES-R IFR Probabilities, above, (click here for an animation with a faster dwell rate) once again capably outlined the region of IFR conditions over South Carolina. Probabilities are lower when Satellite data cannot be used as a predictor, as when cirrus clouds prevent the satellite from viewing water-based clouds closer to the surface. In such cases when only Rapid Refresh model data can be used as Fog Predictors, the fields take on a flatter, less pixelated character as above. There are a few regions where breaks in the cirrus cloud allow Satellite predictors to be incorporated in the IFR Probability fields, for example along the South Carolina coast at 0600 UTC. When high clouds are present, interpret the magnitude of the IFR Probability in a different way than when high clouds are absent. An IFR Probability of 55% in a region of cirrus clouds has a different meaning than an IFR Probability of 55% in a region of only low clouds. Because of Cirrus clouds, the brightness temperature difference fields gave almost no information about the presence of low clouds. See the animation below (a loop with a faster dwell rate is here). This entry was posted in AFD, Mid-Atlantic, Multiple Cloud Layers, Southeast on December 4, 2014 by Scott Lindstrom. FOLLOWED BY COLD FRONTS SATURDAY NIGHT AND AGAIN LATE MONDAY. EVENING WITH THE ONSET OF NOCTURNAL COOLING AND STABILIZATION. 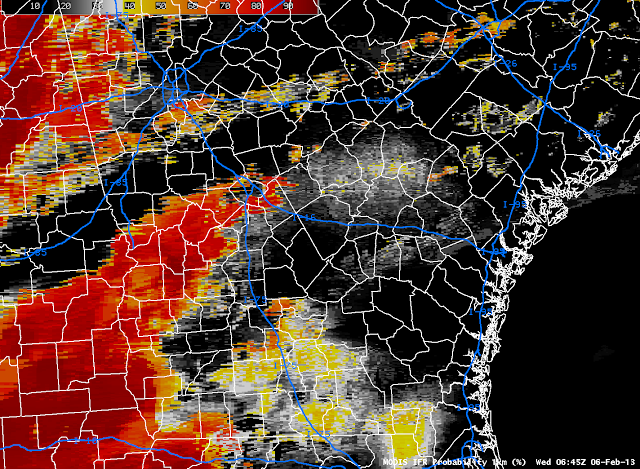 TOWARD DENSE FOG BECOMING A CONCERN…THAN NOT. The GOES-R IFR Probability fields, shown at hourly intervals above, nicely capture the spread of the extensive fog as the expanding marine fog bank joins up with the developing radiation fog over northwestern South Carolina. (A loop with a shorter dwell rate is here). 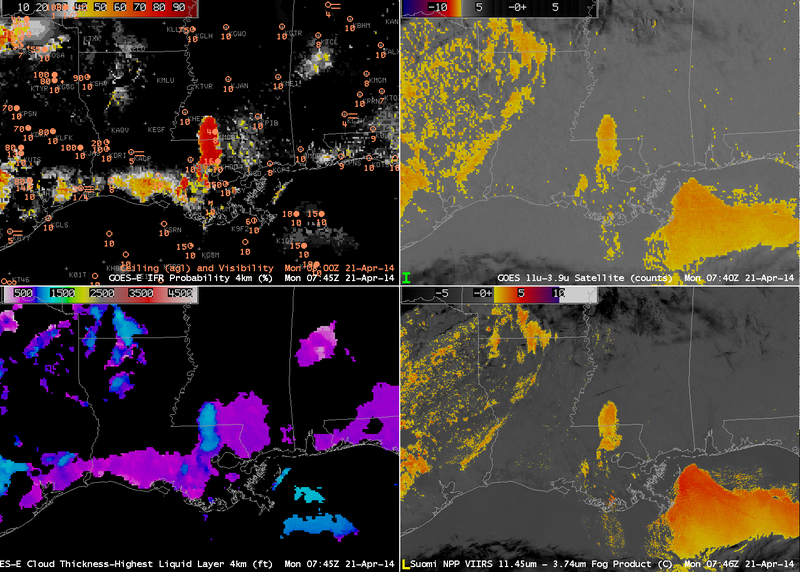 GOES-13 Brightness Temperature Difference Fields are shown below. (A loop with a shorter dwell rate is here). Brightness Temperature Difference is the traditional method of detecting fog and low stratus, and it is referenced in the AFD above. However, the method cannot operate in regions with high cirrus (such as over Tennessee and northwest South Carolina after 0900 UTC); the brightness temperature difference signal flips sign as the sun rises (as at 1315 UTC in the animation below); the method cannot distinguish between elevated stratus and visibility-restricting fog. In comparing the two animations, note how the Brightness Temperature Difference field, for example, has strong returns around 0215-0315 UTC over central South Carolina in regions where widespread IFR conditions do not yet exist. In these regions, the Rapid Refresh model data used as a predictor in the GOES-R IFR Probability is not yet showing saturation, so IFR Probabilities aren’t quite so high as they are along the coast. (Click here for a toggle between the GOES-R IFR Probability and the Brightness Temperature Difference fields at 0215 UTC; a toggle at 0315 UTC is here). Note also in the toggles how the IFR Probability fields have little signal over Georgia despite the Brightness Temperature Difference field signal. This demonstrates the power of using fused data products: both the satellite and the model signal must be in accord for very high probabilities to occur. This entry was posted in AFD, Deep South, Mid-Atlantic on December 3, 2014 by Scott Lindstrom. Fog overspread much of southern New England overnight on 11-12 November 2014. Subsequently, the NWS in Taunton tweeted two times about the fog. 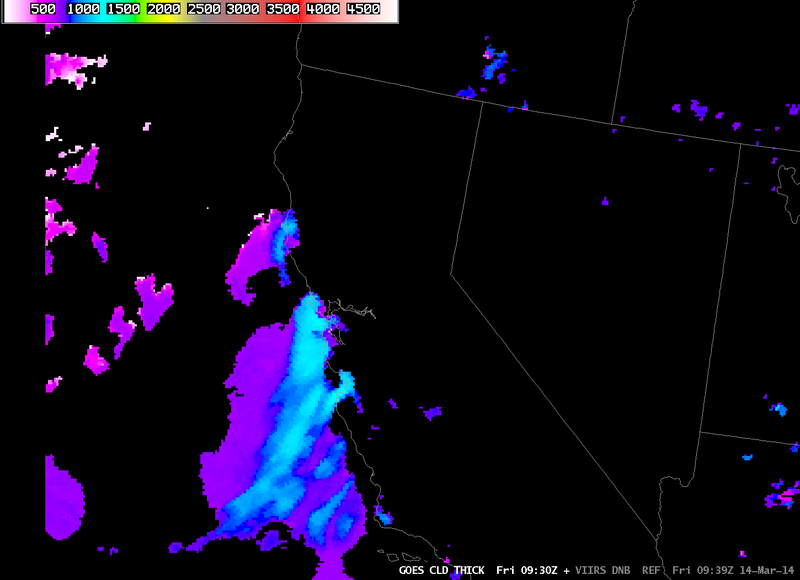 How well did the GOES-R IFR Probability Fields diagnose this fog event? Note the presence of high and mid-level clouds in the picture at top, from the morning of 12 November. Their signature should be in the IFR Probability fields as well, and that is the case. 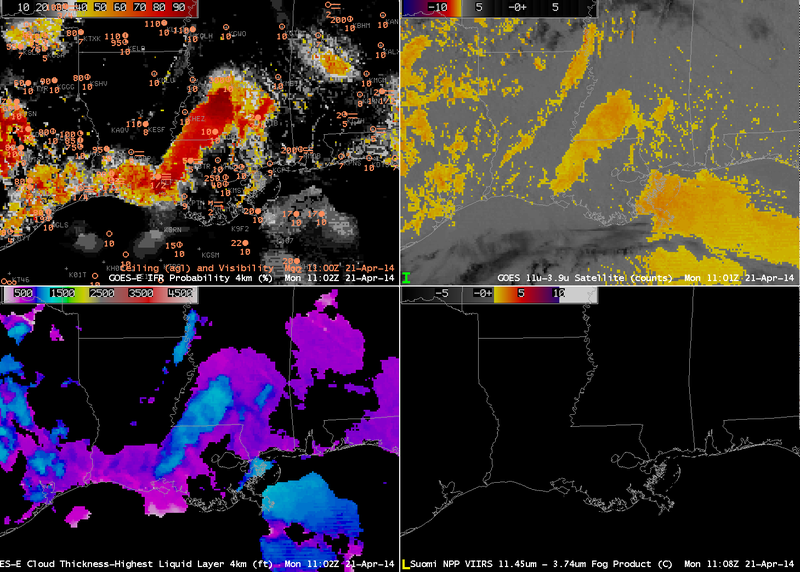 In the animation above, the effect of high clouds is obvious on the IFR (and Low IFR) Probability fields: when mid-level or high clouds prevent satellite data from being used as a predictor in IFR Probability fields, then model data are the main predictors. Model data have coarse resolution relative to satellite data so the IFR Probability fields in those regions have a smoother look that is not at all pixelated. 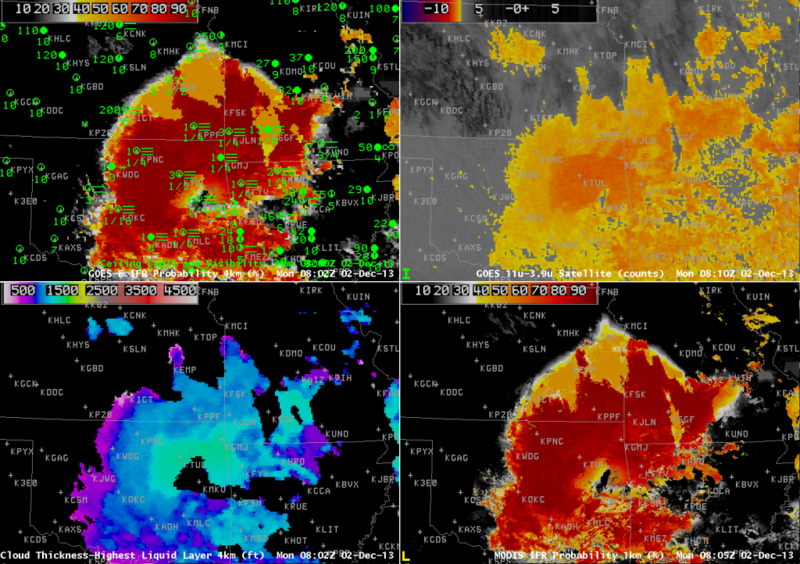 Note how a signal in of low clouds in the Brightness Temperature Difference Field (orange or yellow enhancement) nearly overlaps the more pixelated parts of the IFR and Low IFR Probability fields. Where cirrus/mid-level clouds are indicated in the brightness temperature difference fields, IFR and Low IFR Probability fields are smoother; these are also regions where the GOES-R Cloud Thickness (which field is of the thickness of the highest water-based cloud viewed by the satellite) is not computed because ice-based clouds are screening any satellite view of water-based clouds. Note how southeastern Massachussetts in the animation above — under multiple cloud layers — has relatively small IFR and low IFR (LIFR) Probability values in a region where dense fog is reported. This arises because the model being used — the Rapid Refresh — to generate IFR Probability predictors is not saturating in the lower levels. It is important to remember that when satellite data are missing, only model data are used to generate GOES-R Fog/Low Stratus products. To rely on only the IFR Probability fields as an indication of the presence of fog is to believe the model simulation in that region is correct. Sometimes the model simulation is correct (this case, for example); in the present case, however, there were regions in southeastern Massachusetts where the model forecast did not accurately represent the observed conditions. Suomi NPP overflew New England around 0700 UTC on 12 November, and the data collected are included in the image toggle below. Suomi NPP better resolves some of the smaller valleys in interior New England, and some of the sharp edges to the fields. This entry was posted in AFD, New England, Suomi/NPP on November 12, 2014 by Scott Lindstrom. 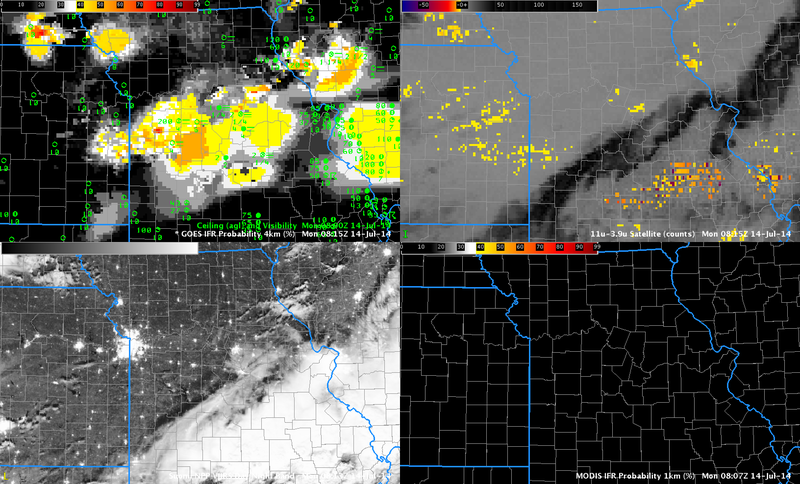 Moisture from departing late-day thunderstorms allowed for the development of dense fog over central Missouri overnight. 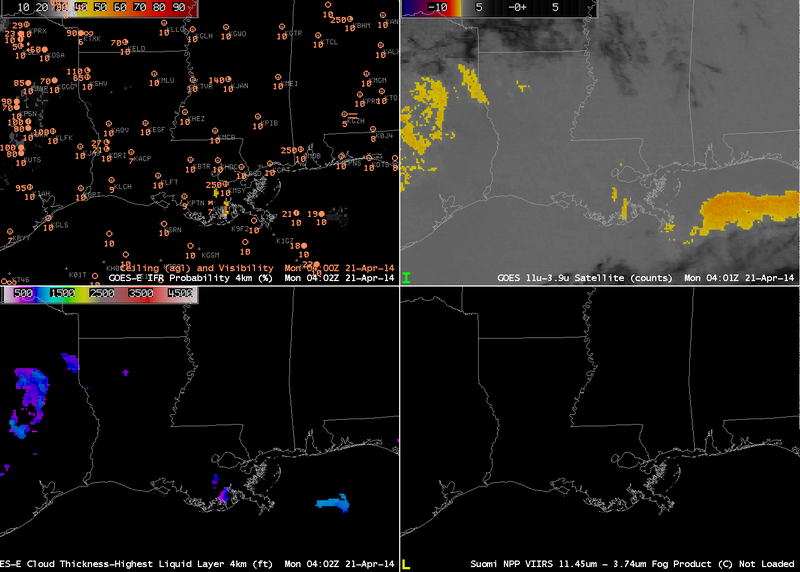 The GOES-based IFR Probabilities, above, capture the low ceilings and reduced visibilities that developed. The traditional method of fog detection, the brightness temperature difference (BTD) between the 10.7 µm and 3.9 µm fields, was hampered by mid- and high-level clouds associated with the departing convection. Polar-orbiting satellites such as Terra, Aqua and Suomi NPP can give high-resolution views of developing fog. In the present case, Terra overflew the region near 0400 UTC. 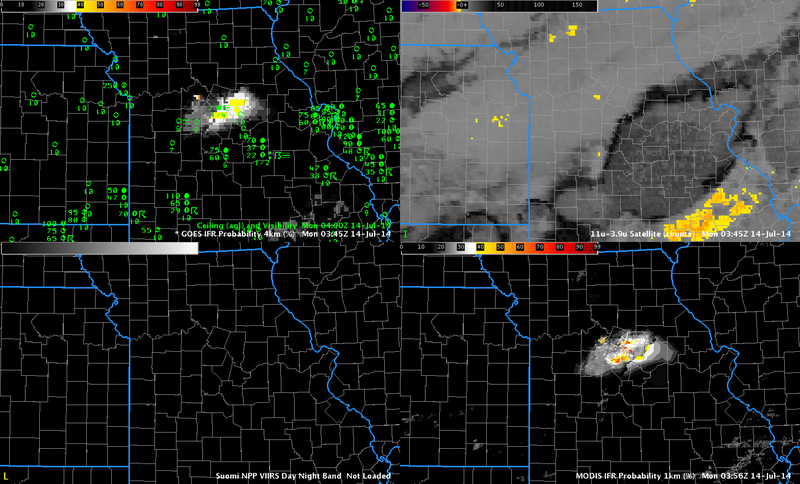 The image below shows enhanced MODIS-based IFR Probabilities confined to central Missouri. An Aqua overpass at ~0800 UTC similarly gave a high spatial resolution view of the area. 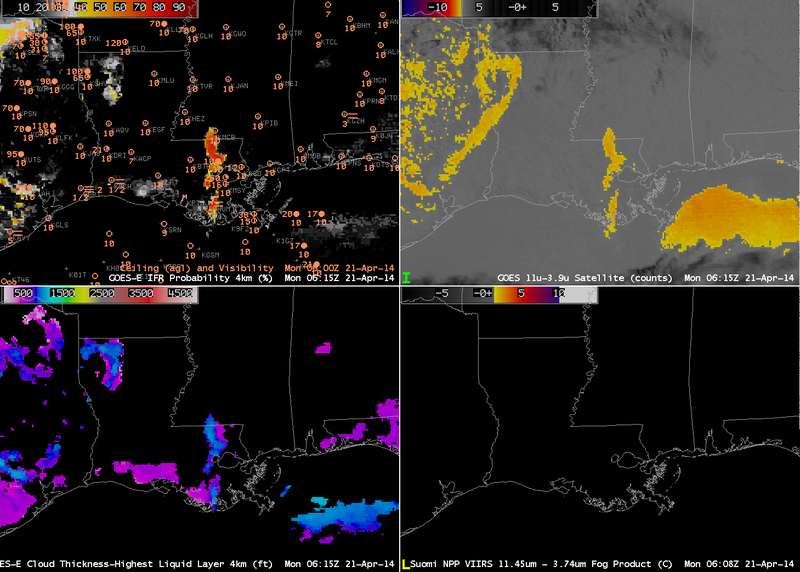 Of course, Terra and Aqua and Suomi NPP only give occasionaly snapshots. To see the ongoing development, temporal resolution as from GOES is key. But the polar orbiters can give an early alert if developing fog starts out at small scales that might be sub-pixel scale in GOES. ADVISORY…WHICH IS IN EFFECT UNTIL 9 AM CDT THIS MORNING. second cold front, poised to move through the area today. coverage and exact timing preclude any TEMPO groups at this time. with any storms that move over the terminals. This entry was posted in AFD, Day/Night Band, Midwest, MODIS on July 14, 2014 by Scott Lindstrom. AND A CHANCE OF RAIN FOR THE OUTER PORTION OF THE FORECAST PERIOD. OF ABOUT 1300 FT. SOME THIN HIGH CLOUDS ARE ALSO PASSING THROUGH ABOVE. The animation of satellite and satellite-derived fields, above, shows how the GOES-R and GOES-West fields depicted the development of the low clouds. Note how the brightness temperature difference fields over CA and NV throughout the animation have a speckled appearance. These positive signals are due not to the presence of fog/low clouds but rather to differences in emissivity properties of the dry land. 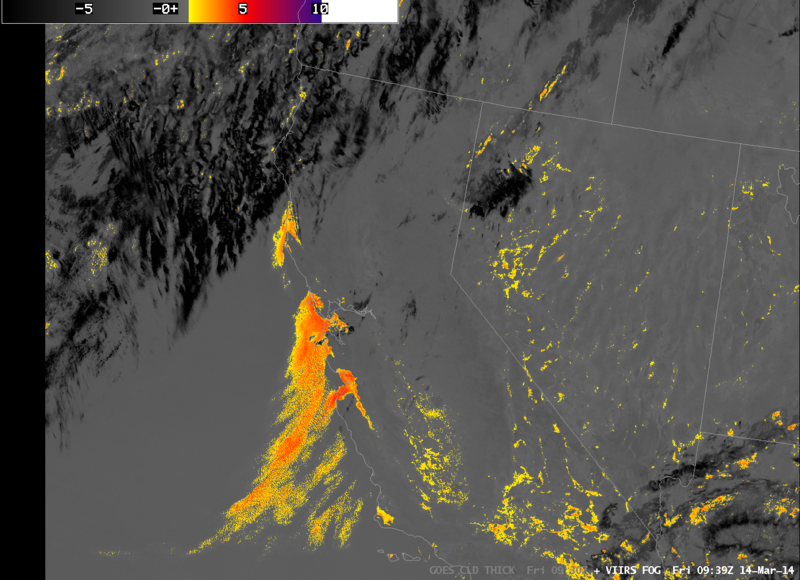 Near the end of the animation, high clouds are widespread over northern California. For such cases, the brightness temperature difference product provides little information about low-level clouds. However, the GOES-R IFR Probability field, because it blends together information from satellite and from Rapid Refresh does provide a signal under clouds. It is a much smoother signal because it does vary from one satellite pixel to the next, and the Probability values are smaller because satellite predictors cannot be used in the algorithm. The AFD above notes the Day/Night band, and also the depth of the marine stratus. The toggle of Cloud Thickness, Day/Night Band, and brightness temperature difference, below (useful to distinguish white clouds from white city lights! ), shows a nice overlap between the GOES-R product and the clouds detected at high resolution by Suomi/NPP. Cloud thickness is around 1150 feet at Bodega Bay, and closer to 1250 feet at Fort Ord, in good agreement with the profile data cited. 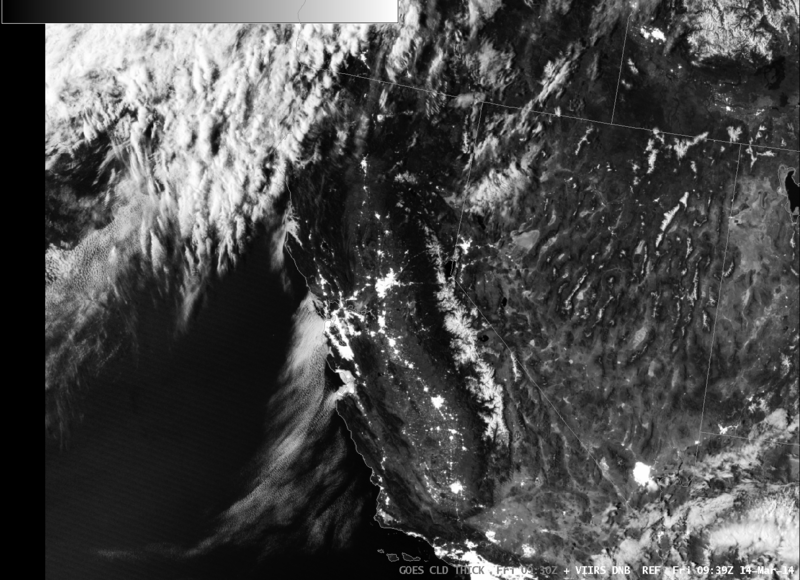 This entry was posted in AFD, California, Cloud Thickness, Day/Night Band, Suomi/NPP on March 14, 2014 by Scott Lindstrom. Dense Fog developed over the southern Plains overnight, and the case demonstrates how the Fused data product is able to give a useful signal of IFR probabilities even in regions where high clouds preclude the detection of low clouds by satellite. The fog was widespread and dense enough to warrant Dense Fog Advisories from Tulsa, Norman and Topeka forecast offices. See below, for example. CONDITIONS WILL RESULT IN AN INCREASING FIRE WEATHER CONCERN. Satellite detection of this fog event was constrained by the presence of two upper-level cloud decks. At the beginning of the animation, above, high clouds associated with the subtropical jet are over the southern quarter of the domain plotted. These high clouds quickly shift southward, and the region in the brightness temperature difference product that is consistent with detection of fog/low stratus (that is, low water-based clouds) expands to the south (surface observations suggest the low stratus clouds were present earlier, but masked by the higher clouds). Later in the animation, high clouds sag southward into the northern part of the domain. When this happens, low stratus/fog (indicated in observations by IFR conditions) are not detected by GOES because the higher ice clouds block the view of the scene. However, the IFR Probability fields that use both satellite data and output from the Rapid Refresh Model continue to depict a likely region (confirmed by the observations) of reduced visibilities. 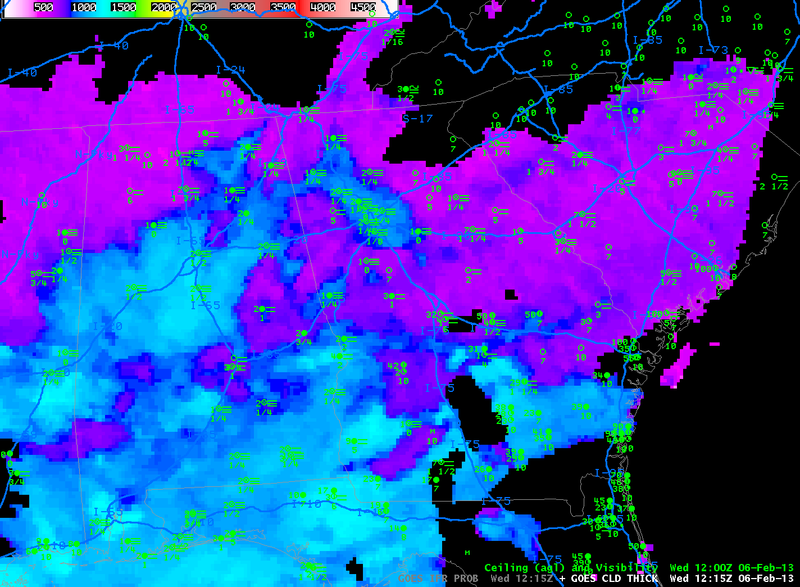 IFR Probabilities do drop, of course, as satellite data cannot be used to confirm the presence of low clouds. Knowledge of why the probabilities drop is vital to the interpretation of the field: You have to know that the high clouds are present, either by looking at the satellite data, or by understanding that the character of the IFR Probability field changes to one that is less pixelated when satellite data cannot be included because of ice clouds above the low stratus deck. For a large-scale event like this, MODIS-based IFR Probabilities overlap well with GOES-Based IFR Probabilities, as shown in the image above. In cases like this sometimes individual river valleys will show up with slightly elevated IFR Probabilities (or cloud thicknesses). The GOES-R Cloud Thickness field is computed for the highest water-based cloud detected (during non-twilight conditions — that is, not during the hour or so surrounding sunrise and sunset). 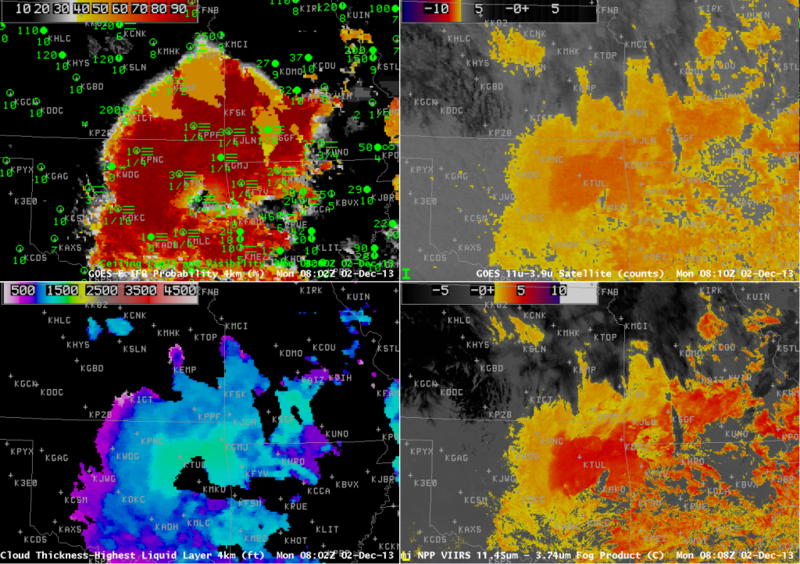 Note how well the thickest clouds — over northeast OK, surrounding Tulsa — correlate with the strongest Brightness Temperature Difference, both in GOES and in Suomi/NPP data (below). Note also how the Cloud Thickness field is not computed in regions where higher ice-based clouds are present. Cloud Thickness can be used to predict the time of fog dissipation, using this scatterplot/relationship. If sun angle is limited by the season, or if solar insolation is limited by higher clouds, you might adjust the first guess for dissipation to a later time. This entry was posted in AFD, Cloud Thickness, MODIS, Multiple Cloud Layers, Plains, Suomi/NPP on December 2, 2013 by Scott Lindstrom. 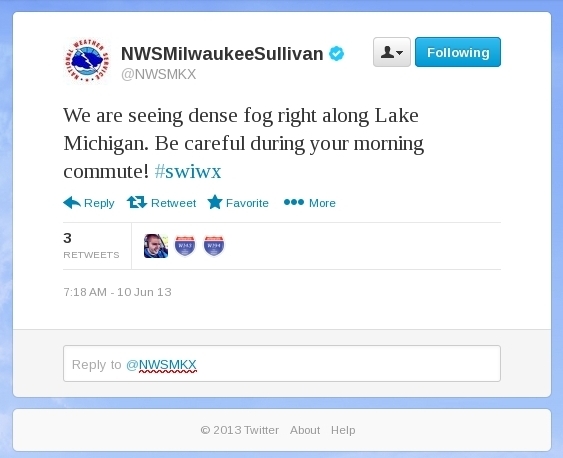 Fog from Lake Michigan is a year-round hazard for travel in eastern Wisconsin. One of the biggest crashes on an interstate in Wisconsin occurred in October 2002 on I-43 near Sheboygan as fog moved onshore. 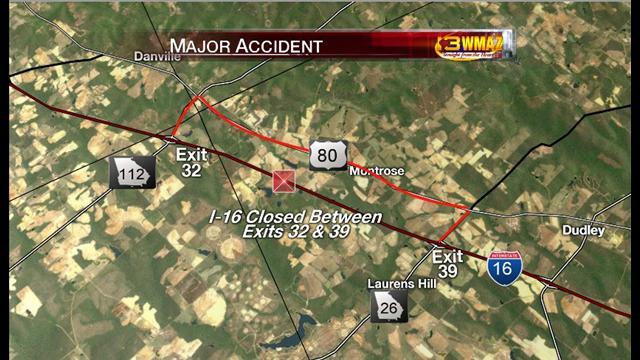 Ten died in that event that included 25 vehicles. Rain overnight followed by partial clearing led to widespread fog over the upper Midwest on June 10, 2013, and the IFR Probability products described the horizontal extent of the lowest visibilities. 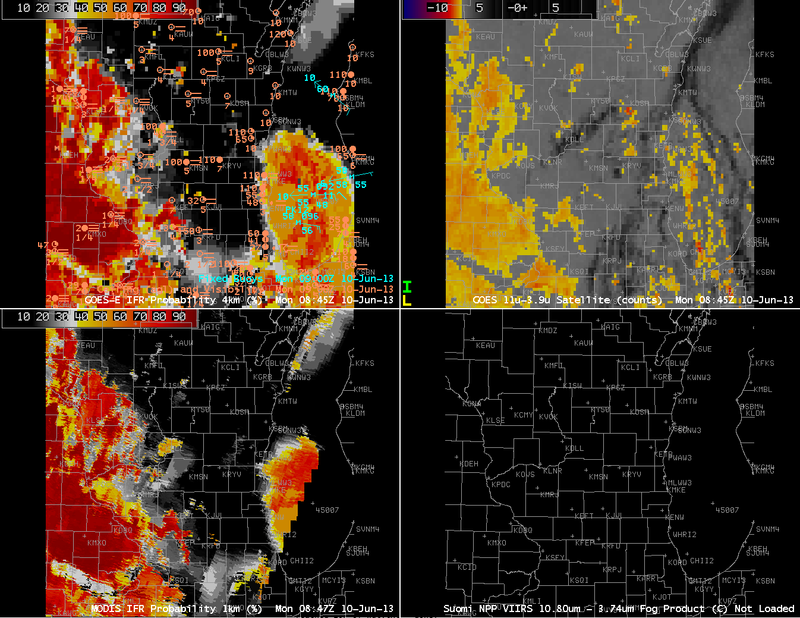 Those low visibilities hugged the coast of Lake Michigan in eastern Wisconsin. GOES-R IFR probabilities increase in two regions overnight: over Iowa and in the western Wisconsin River Valleys, and over Lake Michigan. Reduced visibilities are reported in and around Lake Michigan, and as the tweet up top shows, dense fog was reported along highways as well. Water temperatures in the upper 40s over central Lake Michigan promote the development of fog, as dewpoints over Wisconsin were near 60. The GOES Imager usually cannot resolve small river valleys. Polar-orbiting data, however, usually can. The MODIS-based IFR probability from 0847 UTC better resolves the Wisconsin River Valley over southwest Wisconsin, for example. This entry was posted in AFD, MODIS, Wisconsin on June 10, 2013 by Scott Lindstrom. This entry was posted in AFD, Alaska, MODIS, Suomi/NPP on March 12, 2013 by Scott Lindstrom.